If you want to learn the basics of vegan nutrition, Vegan For Life is the comprehensive, up-to-date, and reliable book that you're looking for! Written by Jack Norris and Ginny Messina, both registered dieticians, Vegan for Life is an easy-to-read guide to meeting your nutrition needs and building a meal plan. Vegan for Life has nutrition recommendations for pregnancy and breast-feeding, kids, and athletes. Norris and Messina debunk persistent myths about veganism by carefully looking at what the science says. They're not afraid to review all of the research — whether or not a study portrays veganism in a positive light — to come up with recommendations that are trustworthy. You don't need to have a science background to read the book, as it is written for a general audience. Whether you're a long-time vegan, just getting started, or simply interested in vegan nutrition, Vegan for Life is highly recommended. Get and read your copy today! A recent column in the New York Times by cookbook author and foodie Mark Bittman was extremely encouraging to advocates of a diet that that supports justice and respect for animals in our world. The column points out that despite the average climb in meat consumption over the last half century (the average American eats a half a pound per day), in the last several years that number has actually been decreasing. The department of agriculture projects that meat and poultry consumption will fall again this year, reaching over 12 percent less than in 2007. While beef consumption has been falling for the past 20 years, only in the last five years have chicken and pork consumption also joined in the decline. Experts attribute this decline to many factors, including increasing prices due to export markets, increase in feed prices due to ethanol production, and drought. 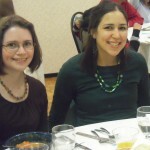 We celebrated animal-free chili on Saturday, February 25. Once again, the Cook-Off was incredibly popular! Amazingly, the same competitors as last year won first and second place again! Twelve contestants entered their chili this year. "Helped me appreciate vegan food more"
"I am interested in a vegan diet"
"Soooo delicious. After 8 years vegetarian, gonna try (vegan)"
Thanks again to Seward Community Cafe for hosting the event. 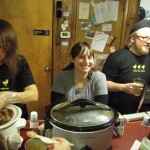 Attendees also enjoyed vegan corn bread and Chili for the 99% donated by volunteers and the Seward Co-op. Thanks to the generous businesses that donated prizes: Galactic Pizza, Pizza Luce Seward, Common Roots Cafe, and Seward Co-op. Thanks to Robin Garwood for hosting and to all the volunteers for making this event a success! Are you ready for the Twin Cities first ever all-day celebration of compassionate living, delicious plant-based food, and thought-provoking speakers? Mark Berkson, Professor of Religion, Hamline University, will be speaking on the topic of animals in religion. Scott Heiser, Director of the Criminal Justice Program, Animal Legal Defense Fund, will be speaking about animal law. Shannon Kimball, Humane Educator, Bridges of Respect, will be speaking on the topic of teaching compassion. Erica Meier, Executive Director, Compassion Over Killing, will be speaking about animal rights. Dave Rolsky, Board Member and Co-Founder, Compassionate Action for Animals, will be speaking about how to be an activist. 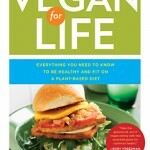 Suzy Sorensen, RD, LD, CDE, Move2Veg, will be speaking about vegan nutrition. Join Compassionate Action for Animals at our Annual Banquet on April 5, 2012, celebrating fourteen years of advocating for animals. Please buy your tickets today! Focusing on action, education, and outreach to inspire respect for animals, CAA touches hundreds of human lives and saves thousands of animal lives. Through the dedicated efforts of CAA volunteers, thousands of leaflets are distributed to increase awareness of the plight of factory farm animals, hundreds of individuals pledge to try vegetarianism, social gatherings are held to bring like-minded people together, and inspirational speakers from across the country educate the public about those who cannot speak for themselves. The event begins with a reception featuring a selection of delicious hors d’ouevres. During the reception, bid at our silent auction featuring artwork, gift baskets, services from local vendors, and more. The reception is followed by a gourmet vegan dinner. During dinner, CAA will give a short presentation on our work in 2011 and our plans for 2012. Please purchase your tickets to reserve your meal! 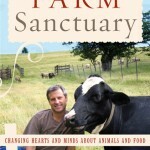 We're hosting our first book club meeting, where we will be discussing Farm Sanctuary by Gene Baur. We've moved the book club meeting to the Van Cleve Recreational Center 901 15th Ave. SE Minneapolis, MN. A brief overview and introduction of the selected book, Farm Sanctuary by Gene Bauer, will be discussed as well as a demonstration on how to obtain the book through interlibrary loan and other sources. You do not need to have read the book prior to this meeting. Refreshments will also be provided! The Compassionate Living book club is a great way to get involved with animal rights issues, develop an intellectual understanding of these issues, and build community with like-minded people. Meatless Monday to start on January 23! Pioneer Hall will serve an all-vegetarian meal for lunch on January 23 and 30. If you live in the residence halls at the University of Minnesota, Twin Cities, be sure to check it out and give positive feedback! If you live in the dorms, go to Pioneer Hall with a friend on January 23 and 30. Try out the food and let UDS know you want it to continue. You can fill out a comment card, call them at 612-626-7626, email them, or post on their Facebook page. If you know somebody who lives in a residence hall, tell them about Meatless Monday and encourage them to check it out. Everybody can help by spreading the word about CAA's successful campaign, choosing to eat meatless on Mondays, and spreading the word about the growing movement to eat less meat. Thanks to University Dining Services for making Meatless Monday a reality! VegGuide.org’s New Partner: Vegan Outreach! We're pleased to announce that Vegan Outreach will join us in running VegGuide.org, our online resource for veg-friendly restaurants and shopping. Vegan Outreach is a twenty-year-old national animal advocacy organization that educates the public about factory farming and plant-based eating, primarily through the distribution of leaflets. Vegan Outreach has distributed more than 15 million booklets since its founding. VegGuide.org was started in 2002 and is a leading source for vegetarian and vegan restaurant and shopping reviews, with more than 14,000 restaurant and business listings. VegGuide.org lets users create entries, write reviews, and rate restaurants and businesses. Additionally, it's free of advertising, focuses on helping people find useful resources to move towards veganism, and all of its content is available free of charge under a Creative Commons license. Register to Compete in our 3rd Annual Vegan Chili Cook-off! Do you have a secret family recipe for chili that can top them all? Can you make it vegan? Then make a big batch and put it to the test on February 25! Registration is open to compete in Compassionate Action for Animals' 3rd Annual Vegan Chili Cook-Off. Prizes for 1st, 2nd, and 3rd will be offered and include gift certificates to Galactic Pizza, Pizza Luce Seward, and Common Roots Cafe. Please enter today! Registration is only $20 (non-refundable). Contestants must bring 15 cups of prepared vegan (no animal products) chili, a list of ingredients, and a crock pot (or something without an open flame to keep your chili warm). Please note that we can only accept 13 entries. Hosted by Robin Garwood, the chili cook-off is once again a free event open to the public at the Seward Cafe. Enjoy free refreshments, cornbread, and of course, vegan chili. Share a cold evening with warm animal-friendly folks. We packed the cafe last year, and expect a full crowd again. 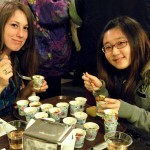 Please join us at our next Dine-Out on January 30, 2012 at the Jasmine Deli. The previous newsletter had an incorrect date. 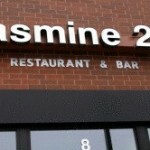 Jasmine 26 is an excellent contemporary Vietnamese vegan-friendly restaurant. Vegan options include tofu and mock duck stuffed crepes, sea salt and pepper tofu cube and veggie pho. Hope to see you there!